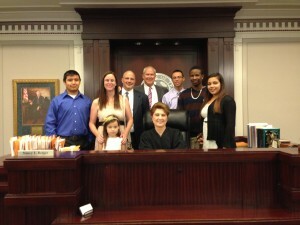 No greater joy than assisting a man or a woman with the adoption of a child — a step-parent adoption. Consider a common scenario: there is a disengaged father or mother who spends no time with their child and does not support the child in any way. The custodial parent has remarried and the step-father or step-mother is raising the child as their own. The step-parent wants to adopt the child. This is a step-parent adoption. The step-parent adoption process is similar to a regular out of family adoption in that it is both a termination procedure and an adoption. Essentially two lawsuits in one. However, the step-parent adoption is more streamlined and more efficient than a regular family adoption. A number of the obstacles for a regular adoption are not required in a step-parent adoption. What is an adoption? It is a legal process where a biological parent’s rights are terminated and an adopting parent takes that person’s place. The relationship between the biological parent and the child is severed. There is no more biological parent – that person is just like anyone else a stranger on the street with no rights what-so-ever. In their place, an adult adopts the child and become the child’s parent with all the same rights and duties as any other parent. The adopting parent for all purposes fills the shoes of the biological parent just like the child were their own DNA offspring. A step-parent adoption is unique because only one biological parent is terminated and one biological parent will remain a parent. Termination: the natural parent, the disengaged parent, relationship with the child must be terminated. This is usually done by an Affidavit to Terminate the Parent Child Relationship signed by the natural parent. In addition, the termination of the biological parent may be involuntary. The grounds for involuntary termination are set out in Chapter 161 of the Texas Family Code. An involuntary termination will dramatically complicate the step-parent adoption. Note also, the parent whose rights will be involuntarily terminated has the right to a jury trial on this issue. This will further complicate the step-parent adoption if they request a jury. The best and easiest step-parent adoption is the one where the biological parent signs off on an Affidavit to Terminate the Parent Child Relationship. The affidavit must be witness by two credible persons and verified before a notary. Note: we get calls all the time about someone wanting to “terminate their rights” in order to avoid child support. First, you can’t terminate the parent-child relationship on this basis – to avoid paying child support and the court won’t allow it. If the court did terminate, that person is still obligated to pay child support. An adoption starts by filing a petition to terminate the biological parent and adoption of the step-parent. The petitioners are the husband and the wife and both must join in the petition. Several orders are then presented to the court which will authorize a pre-adoptive social study and a post-placement social study to evaluate the parties. This is an investigation into the facts and circumstances of the adoption. It is required. The court will then appoint a social study investigator to perform this task who will reduce their investigation into a written report. The written report is then filed with the court and given to the adoptive parent prior to the hearing. In addition, the court will order the adoptive parent to obtain their own criminal history. This can usually be accomplished by going to the Department of Public Safety and requesting the report. This too is submitted to the court. We will order the criminal history report and request that the department transmit it directly to the court. Generally, before the adoption can be granted the child must have resided with the adoptive parent for six months. This time period can be waived if it is in the best interest of the child. It is pretty common for a court to grant this request. The Court Appearance. A court appearance is required to “prove-up” the adoption. Most families attend the adoption which is ceremonial in nature as a way of celebrating this event. Most judges are going to make this a memorable occasion. After presentation of the testimony, the Judge will then sign an order terminating the biological parent and granting adoption of step-children. Pictures will be taking and persons in the gallery applaud. It is always a pleasure to do these. Given that most family lawyers earn their living representing parties in the dissolution of family, the step-parent adoption is one where family is made whole.